The space shuttle astronauts currently wear two difference types of space suits. The Advanced Crew Escape Suit (ACES) is worn during the launch and reentry phases of flight. 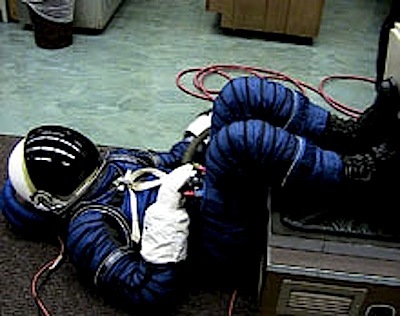 Astronauts wear a second suit, called the Extravehicular Mobility Unit (EMU), when they perform tasks outside the confines of the shuttle or the ISS. David Clark Company, in partnership with Oceaneering International, is designing a new U.S. space suit. The first configuration (shown below) is designed for launch, descent, and emergency activities, while the second design is meant for lunar exploration. The new design will also let astronauts work outside of the International Space Station (ISS) and will be suitable for trips to Mars, as outlined in NASA's program for exploration, called Constellation. "The current suits just cannot do everything we need them to do," says Terry Hill, the Constellation space suit engineering project manager at NASA's Johnson Space Center in Houston. "We have a completely new design, something that has never been done before." NASA has proposed a plug-in-play design, so that the same arms, legs, boots, and helmets can be used with different suit torsos. "It's one reconfigurable suit that can do the job of three specialized suits," says Hill. As far as I know, the earliest specific reference to the idea of a space suit is in Edison's Conquest of Mars, an 1898 novel by Garrett P. Serviss. The earliest use of the phrase "space suit" that I've found is from The Emperor of the Stars. a 1931 short story by the great team of Schachner and Zagat. Update: Ashley reminds me that mechanical counter-pressure suits can also work; see my previous article BioSuit Space Suit Vs. Tentacle Monsters for pictures of Dr. Dava Newman and her suit (that I took myself!) at NextFest 2006. End update. From Technology Review. Thanks to nyrath for the tweet on this story.